Mobile Websites – Coffee Black Web Design has a dedicated team of forward thinking mobile website design specialists who strive to offer the best user experience possible for iPhones, smartphones, tablets, iPads and laptop users. There are currently six billion mobile phone subscriptions in the world – Further statistics can be viewed from the BBC. Statistics this high speaks for itself, Coffee Black Web Design believe in the importance of mobile website design and the many factors of why its important for businesses to have mobile optimised websites. 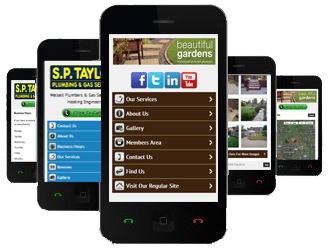 Mobile website design is a common method to think about whilst in the website development process. Everyday, millions of people in the world use their mobile phones or tablets to access the internet and websites that they commonly visit on a daily basis. It could be YOUR website if it has undergone an effective SEO (Search Engine Optimisation) campaign. Having a business website online is extremely important for any business but is it mobile ready? Is your website designed and built to be seen on these devices? Coffee Black Web Design focus on mobile website development heavily, we will always advise you on the benefits that mobile website design has to offer and we can work out a strategy that covers every mobile device that you feel will be beneficial for your business. The main benefit is really clear in terms of mobile website design, allowing mobile device users to access your website and services in a simple and clear manner by improving their user experience. This of course is not the only benefit of mobile website design, by having a mobile website, your company will appear as forward thinking, innovatie and pro-active, this ensures a positive feeling to your potential customers about who your company is and how you work. Mobile websites are specifically designed for handheld devices such as your mobile or an iPad or a similar tablet, nobody wants to browse a desktop website on their mobile. Research on mobile website usability shows that mobile optimised websites significantly improve user experience and satisfaction, which makes a positive impression as and when it counts. The key to converting visitors into customers is accommodation. If a customer is unable to find what they came for, they will leave and move over to your competitors. Web users who browse online for products and services are more likely to buy from a company that has a well designed and fully functional mobile website rather than a desktop website that requires more effort to use on a mobile device. Does your website fit to the screen of your Mobile or Tablet? Coffee Black Web Design can implement your website onto any mobile device that you require, a website looks completely different on each and every device, this is where our highly skilled mobile website designers focus on delivering you and your customers a friendly and effective mobile user experience. Coffee Black Web Design deploy an effective form of communication via all aspects of website design, this can be carried out in mobile website design. We like to make use of quick contact making it easy for customers or website visitors to get in touch with you directly in the most simplest way possible. We make sure that your phone number, email, and business map location are placed prominently on your site so that website visitors can access your contact information in just a few touches of their device. We at Coffee Black Web Design believe that it is a good idea to streamline the text on your mobile website, as well as cut down to only necessary images. This way your text is to the point and easy to read, and you don’t have so many images that your website takes too long to load. There are implementations that we can do such as banner slideshows that fit into the top of your mobile website, this can be carried out throughout every page or as a standalone feature for the homepage. Coffee Black Web Design include a link back to your regular Desktop website, this gives customers and website users the opportunity to view all of the features of your normal (desktop) website, without having to put all of those features on the mobile version. Mobile website design has its limitations in terms of functionality in comparison to a desktop website, however, there are many of really useful features that Coffee Black Web Design can add to boost your mobile website and its design and functionality.